COLORADO SPRINGS, CO--(Marketwired - May 31, 2016) - Gold Resource Corporation (NYSE MKT: GORO) (the "Company") today announced additional Switchback drill results from its Aguila Project's Arista Mine. Gold Resource Corporation is a gold and silver producer with operations in Oaxaca, Mexico and exploration in Nevada, USA. The Company has returned $108 million to shareholders in monthly dividends since commercial production commenced July 1, 2010, and offers shareholders the option to convert their cash dividends into physical gold and silver and take delivery. Each Switchback drill hole intercepted multiple parallel veins (see full table below). Hole 516111 was an infill intercepting four parallel veins, including the Silvia vein which returned 9.50 meters grading 8.85 g/t gold, 669 g/t silver, 0.67% copper, 1.86% lead and 6.83% zinc; including 0.95 meters grading 31.40 g/t gold, 5,420 g/t silver, 1.35% copper, 0.93% lead and 2.32% zinc. Hole 516111 also intercepted the Soledad vein returning 18.27 meters grading 2.23 g/t gold, 191 g/t silver, 0.59% copper, 2.64% lead and 6.18% zinc; including 3.29 meters grading 5.92 g/t gold, 554 g/t silver, 0.53% copper, 0.86% lead and 3.33% zinc. Hole 516114 was an infill intercepting four parallel veins, including the Soledad vein which returned 4.96 meters grading 4.42 g/t gold, 22 g/t silver, 0.62% copper, 0.60% lead and 3.48% zinc. The Sagrario vein returned 13.23 meters grading 4.03 g/t gold, 114 g/t silver, 0.82% copper, 1.60% lead and 2.79% zinc; including 3.15 meters grading 15.79 g/t gold, 110 g/t silver, 1.53% copper, 4.08% lead and 7.11% zinc. 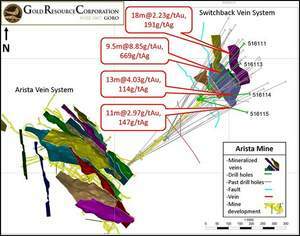 An unnamed vein returned 2.40 meters grading 12.21 g/t gold, 53 g/t silver, 0.99% copper, 3.74% lead and 8.51% zinc. Hole 516115 was a step-out intercepting two parallel veins, including the Sagrario vein which returned 11.09 meters grading 2.97 g/t gold, 147 g/t silver, 0.93% copper, 2.67% lead and 4.29% zinc; including 0.52 meters grading 15.40 g/t gold, 120 g/t silver, 1.37% copper, 2.37% lead and 2.29% zinc. Assays by ALS Chemex, Vancouver, BC Canada. Meters Down Hole, Not true width. The high-grade polymetallic Switchback vein system expands the currently producing Arista Mine mineralization (see map). The Company continues to develop a second drift to access Switchback and targets to crosscut and mine this mineral in the second half of 2016, dependent on drift progression, rock competency, potential water courses and CO2 gas that may be encountered during development. Thus far no appreciable amounts of water or gas have been encountered, though the Company does expect water management to be necessary in the future. These infill and step-out drill results from Switchback confirm continuity of modeled veins and expand previously defined mineralization. The Switchback vein system remains open in all directions, and the Company continues to drill the extensions of this expanding vein system. At December 31, 2015, the Company reported mineralized material at Switchback in excess of 630,000 tonnes. Mr. Barry Devlin, Vice President of Exploration, stated, "This latest round of drill results from Switchback continues to define, as well as expand, this impressive polymetallic vein system comprised of multiple en echelon veins. In particular, step-out Hole 516115 expands high-grade mineralization to the southeast where we had thought precious metal grades may have started to decrease. It is also exciting to see some of the highest gold grades drilled to date at Switchback in these latest intercepts. Our primary exploration goal is to continue expanding the Switchback epithermal vein system in the Arista Mine." "The multiple recent drill intercepts including 9.5 meters of 8.85 grams per tonne gold and 669 grams per tonne silver, on the back of 8 meters of 6.85 grams per tonne gold and 462 grams per tonne silver announced earlier this month on May 10th, speak for themselves," stated Gold Resource Corporation's CEO and President, Mr. Jason Reid. "It is great to be developing towards the Switchback veins while continued exploration success underscores it as a very exciting, high-grade and large new area of the Arista mine." Gold Resource Corporation is a mining company focused on production and pursuing development of gold and silver projects that feature low operating costs and produce high returns on capital. The Company has 100% interest in six potential high-grade gold and silver properties at its producing Oaxaca, Mexico Mining Unit and exploration properties at its Nevada, USA, Mining Unit. The Company has 54,266,706 shares outstanding, no warrants, no long term debt and has returned $108 million back to shareholders since commercial production commenced July 1, 2010. Gold Resource Corporation offers shareholders the option to convert their cash dividends into physical gold and silver and take delivery. For more information, please visit GRC's website, located at www.Goldresourcecorp.com and read the Company's 10-K for an understanding of the risk factors involved.